I woke up Saturday morning, looked in the mirror and thought to myself “wow I look tired”. My thoughts were accompanied with the realization that I am turning 30 in less than a month and my body can no longer bounce back from a Friday night out with the girls like it used to. As we mature the eyelid skin thins and we suffer from loss of fat and collagen. All these things can cause bags, puffiness, and dark circles under the eyes that most of us don’t like waking up to on a Saturday morning as I did this weekend. So here are my tips for waking up those eyes and saying good bye to dark circles, puffiness, and lines! Cold compresses and elevation. I put a cool rag over my eyes while sitting upright for a few minutes. Gravity helped the puffiness. Just like swelling and edema you get anywhere else in the body cold compresses and elevation will help under your eyes too, for the short term. Consider sleeping elevated. TNS eye repair. This is my “go to” for people wanting a cream to help with the fine lines around the eyes. This is a Skinmedica eye cream that has growth factor and antioxidants that will help the appearance of fine lines around the eyes. I also recommend this cream for my patients who get Botox for crow’s feet. It helps overall results for the eyelid skin. Botox- You should always be careful when choosing your injector but when injecting around the eyes, its extra important. I don’t mind when my patients ask me “have you done this before?” or “how were you trained?”. The injector you choose shouldn’t mind either if they are confident in their skills, be picky. Botox can get a slight lift of the brows and help you appear more awake, less tired. Filler- Belotero is a filler that is made to be put very superficial in the skin and unlike most of the other fillers, it isn’t seen when placed superficial. We can place Belotero under your eyes to help that dark hollow look. 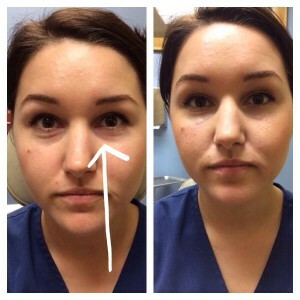 Sometimes using filler in the cheeks to replace volume there shortens the length of your under eye circles. During your cosmetic consultation ask which option would give you the biggest bang for your buck. 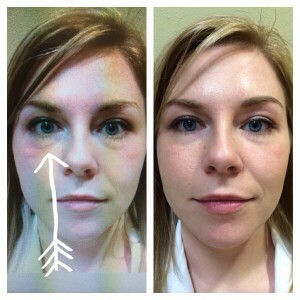 Left is before picture and right is after one syringe of Belotero under the eyes. Notice the appearance of less “puffiness” when the Belotero fills the hollow space. Also take note of the length of the “dark circle”, it shortens after Belotero. Left is before picture, the arrow points to where I injected her. Right is after one syringe of Belotero. Blepharoplasty- This is a surgical option that removes excess fat or sagging skin. We don’t offer this at JD but we have been known to recommend this for you during a cosmetic consultation and can point you in the right direction. I hope with daylight savings springing us forward this weekend you all adjust easily and get plenty of rest tonight and wake up alert and ready for the upcoming week. Have the best week you’ve ever had! Hope to see you all at the clinic this week but if I miss you, stay skintastic!! !